How to get Sipdroid working with sipgate.com account. There are various blog posts that say you need PBXes account, and I looked at that and it all seems tricky. So I decided to try just configuring to not use PBXes. First you need to get the SIP account and password details, like I mentioned in this post www.hutsby.net/2010/02/howto-iphone-sip-isipsimple-and-sipgate.html. Don't forget these details are not the same as your Sipgate sign on credentials! Use Market to install Sipdroid, and then launch. First press the menu button and select 'settings', then 'SIP Account Settings'. Then with the credentials you got earlier, touch Authorization Username and put in the details. For sipgate.com its a 9 character string, 7 numbers, 1 letter, 1 number (left to right). Then in the password field put your password - case sensitive! Then press the back button. Next press 'Call Options' and decide your choices. Be aware (very aware!) that use of your mobile data plan might get expensive! You can see if you are logged in OK by checking for the green dot in the menu bar. Red is bad (ie its failed), orange means its trying to connect. 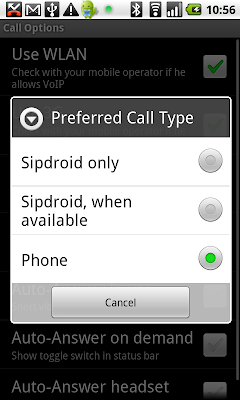 Update: With Android 2.3 ie Gingerbread, there is now a native SIP / VOIP client. Thanks for this guide. I was having a helluva time trying to figure out pbxes. I was having a few problems getting and staying connected, and then I added the STUN server...now it works like a charm. 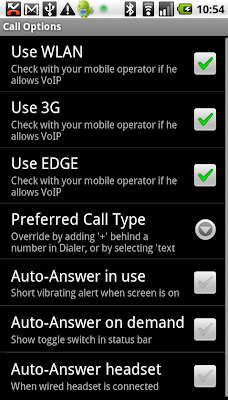 In SIPDROID->Options->Advanced options, check Use STUN server. The address for sipgate is stun.sipgate.net. Port is 4000. They say to use port 10000, but I had no luck with that. In sipgate's guide to configuring the iPhone app, they use 4000, and that has worked for me. You might want to add the STUN server to your guide. I didn't need to use the STUN, but now everyone will see your comment. Has anyone got this to work with T-Mobile UK or are they blocking it? I find running VOIP / SIP over cell is very hit and miss. Can't say about TMobile, but I know Vodafine and O2 sometimes work and sometimes do not. Paul's comment helped me so much. It was weird. I got calls through w/o STUN, but at times the phone just wouldn't register. With STUN, it would register but not put through any outgoing calls. Port 4000 helped! Works Great for me on my aging G1. you can also get the login details you need for sipdroid from within your sipgate account under the overview section. this is about the most useless article i've ever read in my life. thanks, wish I found this before I setup pbxes (which took a bit of fidgeting, but works now). I may try it without pbxes, one less loop to jump through. I got sipgate and sipdroid talking on port 5060, but had to use UDP. (HTC EVO) It would not register with TCP, it would just time-out. Is there an advantage to using a STUN server? this worked great for me as described and also with STUN server enabled. can som eone pleeeeeeease help to set sipdroid on a htc wildfire s!! i have followed ALL the suggestions here so far and i keep getting a red light!! many thanks ...a cry from a desperate user of VOIP on my phone. you could try csipsimple, that works for me as well. Or try the native SIP client now - if you have Gingerbread. your post guided me toward success: my phone's sipdroid app is connected to sipgate. the link to the sipgate faq was improperly formed though! the current link for instructions on the sipgate credentials to enter into sipdroid is https://secure.sipgate.com/faq/setup/index/id/89.